“Early Cherry Blossom Festival,” Histories of the National Mall, accessed April 23, 2019, http://mallhistory.org/items/show/480. As soon as the Japanese cherry trees were planted, Washingtonians and tourists enjoyed the blossoms every spring. 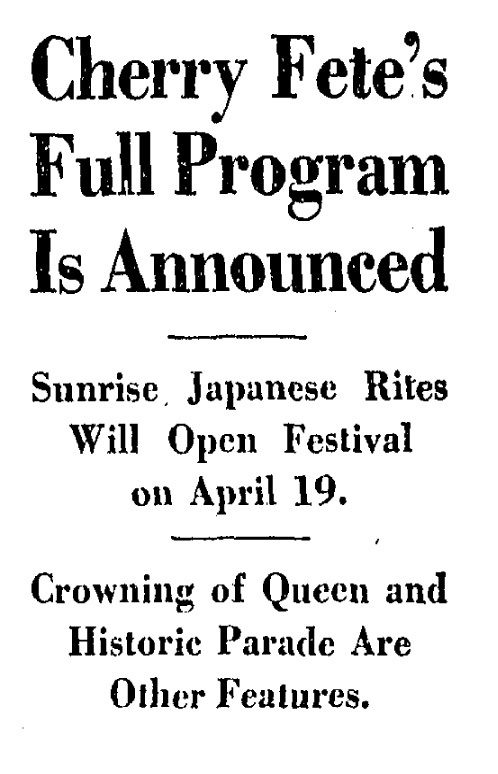 Although there were cherry blossom fetes in the 1920s, they were mostly held in Hains Point. The first Cherry Blossom Festival, which was intended to be the start of an annual tradition, took place in the spring of 1934. First Lady Eleanor Roosevelt and a delegation from the Japanese embassy led the sunrise ceremony that opened the event. The Festival included a parade, a ball, fireworks, and a performance of the Mikado, an English operetta set in Japan, at the Sylvan Theatre. 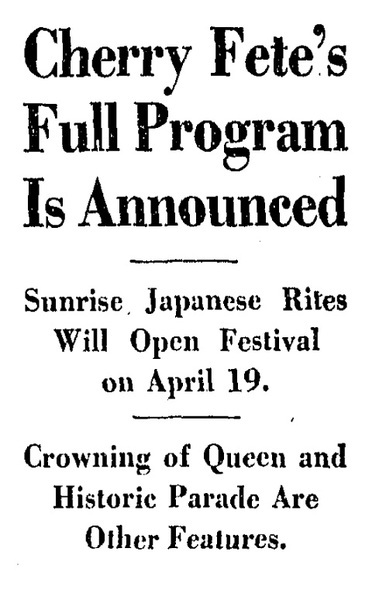 "Full Program is Announced," The Washington Post, April 4, 1934. Histories of the National Mall was developed by the Roy Rosenzweig Center for History and New Media , George Mason University with generous funding from the National Endowment from the Humanities. Content licensed under CC-BY.